In a recent civil action, Botosh v. City (Ottawa), a 26-year-old woman filed a lawsuit against several defendants, including the City of Ottawa, after she slipped and fell on a curb and injured her right shoulder. The accident happened when her left foot clipped the edge of a depressed curb/ramp at the corner of Dalhousie and St. Patrick streets in Ottawa. In addition to the City of Ottawa, Greenbelt Construction Co. Ltd. (a general contractor) and Dibblee Construction Ltd. (the paving subcontractor) were named as defendants in the claim, as they were involved in reconstruction at the location of the accident. The corner sidewalk and curb had not yet been completed and were under construction when the plaintiff fell, and there was a 1.5 inch height differential from the top of the roadway to the top of the concrete gutter and another 9/16 inch gap between the gutter and curb/sidewalk. On the date of her fall, the plaintiff was walking home after grocery shopping and was carrying a small amount of groceries. It was her usual route home and she was not aware that construction on the intersection had not been completed. The plaintiff alleged that the warning signs for the ongoing construction had been removed. The defendants did not dispute that the plaintiff fell by tripping on the curb; however, they denied that they owed her a duty of care in the specific circumstances of the accident. The defendants also stated that the fall occurred because the plaintiff was careless and failed to properly step up with her left foot, and therefore the plaintiff was wholly negligent in her fall. Further, the defendants contended that she did not fall at the location she claimed, but rather, the plaintiff fell when trying to step up onto the curb after jaywalking across St. Patrick Street. A fundamental issue in this case is liability. As a group, the defendants deny any liability. However, if there is liability, the City of Ottawa and Greenbelt allege that Dibblee is liable, and Dibblee alleges that the City and Greenbelt must be liable. Also, if liability is determined, the defendants allege that the plaintiff was contributorily negligent. In addition to the liability issue, the defendants dispute all of the damages claimed by the plaintiff, including the severity of her injuries, general damages, special damages, future loss of income and future care costs. There were no witnesses to the plaintiff’s fall, but the defendants also had no evidence to support their argument that the plaintiff took a shorter or different route, was jaywalking, or did not fall at the location she claimed. And, although Justice Warkentin gained the impression that the plaintiff “tended to exaggerate or find alternative explanations when the factual evidence differed from her evidence”, the judge found her description of the location of her fall to be consistent, from the time she gave notice to the City and throughout the trial. On this basis, the judge accepted that the plaintiff fell where she claimed. Municipalities have a duty to maintain highways, bridges, crosswalks and sidewalks in a reasonable state of repair. If the municipality breaches its duty of care, pursuant to the Negligence Act, it can be found liable for any damages suffered by a person. However, a municipality is not liable for failing to keep a sidewalk, highway or other infrastructure under a reasonable state of repair if it was not aware or could not have been expect to know about the state of disrepair, or took reasonable steps to fix or prevent the state of disrepair. In order for a plaintiff to establish liability due to a breach in the municipality’s duty of care, she/he must prove ‘causation’ based on the following criteria: a) on a balance of probabilities, that the condition of non-repair was not reasonable under the circumstances; and b) that the unsafe condition caused the fall and injuries. If the plaintiff is successful in proving causation, then the onus is on the Municipality to prove one or more of the applicable defences under the Municipal Act, s. 44(3). It should be noted that a ‘reasonable state of repair’ is commonly defined as one in which a person using ordinary care for their own safety could pass in safety. Further, “a plaintiff may bear some contributory negligence for not paying enough attention to where she was walking”, particularly when a plaintiff is familiar with the accident site. A number of experts with considerable experience in road construction gave evidence on behalf of all of the involved parties. Based on their opinions and the plaintiff’s evidence, Justice Warkentin decided that all of the defendants are liable for the condition of dis-repair where the plaintiff tripped and fell. The intersection where she fell is in a high traffic near ByWard Market where there is substantial pedestrian traffic and where sidewalks are an integral component and should be safe and accommodating for all users. These facts were not in dispute. Expert testimony for the plaintiff asserted that the condition of the intersection at the time of the fall constituted a risk to pedestrian safety and was a tripping hazard. Engineering experts agreed that temporary ramping should have been installed as soon as practical, to mitigate the tripping hazard, and there is no reason this couldn’t have been done promptly after the second pouring of asphalt. Also, if there was a delay in temporary ramping, it was suggested that a warning sign should have been erected to alert pedestrians of the vertical gap that caused the tripping hazard. The defendants did not call expert evidence to dispute this opinion, but denied that the condition of the intersection was unreasonable given that it was currently under construction. In fact, it was a major construction project that disrupted both vehicle and pedestrian traffic for several months. However, on the day of her fall, the plaintiff alleged that she thought construction was now complete because there was fresh asphalt and new sidewalks, and she did not see any signs warning of continued construction. There was no evidence that anyone from the City or Greenbelt monitored the condition of the intersection to determine whether there was adequate signage warning pedestrians. By the time Dibblee received notice of the plaintiff’s complaint, temporary ramping had already been installed at the site. Also notable is the fact that another area resident made a complaint that, although road construction had been completed, the sidewalk was unfinished and they wanted to know when it would be done. Justice Warkentin decided that it was foreseeable that, in the absence of temporary ramping and warning signs near the depressed sidewalk, the vertical gap of 1.5 inches was a tripping hazard. Based on this determination, the plaintiff was successful in showing that a state of non-repair existed and caused her to fall. The judge asserted that the defendants should have known or knew about the state of non-repair and should have taken steps to fix it. Therefore, Justice Warkentin found the defendants liable for the plaintiff’s damages. The remaining question was whether the plaintiff is contributorily liable for her injury. The plaintiff has cerebral palsy which affects her left side and left foot, and because of this condition, she testified that she is particularly careful when walking. She tripped after crossing the intersection when she placed her right foot on the sidewalk, then hit her left foot on the top of the vertical gap, which caused her to fall on her arm. The defendants argued that the plaintiff was familiar with the state of the sidewalk as she had previously passed through the same location earlier in the day and in the previous week. However, the judge did not accept this argument for contributory negligence, and asserted that just because she successfully crossed the intersection before, does not mean she is necessarily knowledgeable about the unsafe condition. Further, Justice Warkentin did not accept that her ability to negotiate the step with her right ‘good’ foot meant that, if she was careful, she should have been able to complete the step with her left (disabled) foot. If the accident site had a common height differential with other intersections in the area or there was signage to warn the public of the change in elevation, then a pedestrian would have reason to take extra care. However, in the absence of these circumstances and in consideration of all the other facts, Justice Warkentin found no contributory negligence on the part of the plaintiff. Another question to be resolved is how to apportion liability between the three defendants. The City monitored the progress of the work done by the general contractor, Greenbelt, whom they hired to complete the road construction. Dibblee was sub-contracted by Greenbelt to complete the paving, and Dibblee managed the site after Greenbelt completed their work. Therefore, all of the defendants were occupiers of the site pursuant to the Occupiers’ Liability Act, and each were responsible for site safety. However, Justice Warkentin found that Dibblee took control of the site after Greenbelt’s employees left and had the primary responsibility for site safety at that point in time. Nevertheless, the City and Greenbelt continued to be occupiers of the site due to their authority over management of the site and project, and their obligations to the public. On these grounds, Justice Warkentin found Dibblee liable for 50 percent of the plaintiff’s damages and the City and Greenbelt each liable for 25 per cent. Before making an assessment on damages, the judge noted that even if the plaintiff’s injuries and losses are greater due to her cerebral palsy than for someone without a pre-existing limitation, the law requires that she is placed in the position she was in before the defendants’ negligence caused her accident. The plaintiff claimed that the injury to her right shoulder and the surrounding area has had a permanent and severe impact on all her daily activities and has prevented her from reaching her education and employment goals. The defendants disagreed that her injury is as severe as alleged and that her activities are significantly impacted. From the year following the accident until the present time, the plaintiff’s medical records show that she consistently complained of pain and tenderness in her right shoulder. An MRI revealed a ‘grade 1 shoulder separation’, the mildest form of shoulder injury, and there were no other tests revealing any more serious injuries. At the trial, all medical experts testified that the plaintiff has an injury to her right shoulder area that causes her ongoing pain. However, there was some discrepancy between the testimony from the plaintiff’s medical experts (who largely accepted what they were told by the plaintiff concerning her symptoms and medical history) and the medical charts from the plaintiff’s treating practitioners. For example, her chiropractic and physiotherapy records describe her pain as mild pain that can be alleviated by treatment, but the plaintiff described the pain as violent and severe, such that it prevented her from continuing treatment. Falls are one of the most common sources of serious injury for Canadians, next to motor vehicle accidents. If you were injured in a fall resulting from an unsafe condition, you may be eligible to compensation for any injuries and losses. 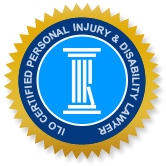 The experienced Ottawa personal injury lawyers have helped many clients obtain owed compensation. Call today to schedule a free consultation and find out about your optimal course of action.